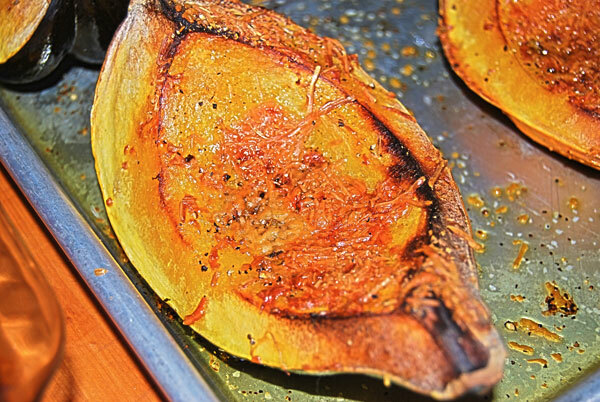 Baked squash was not something we ever ate growing up. Occasionally I would attend a holiday event at someone’s house and they would serve Acorn squash with butter and brown sugar, which was absolutely terrible tasting (read too sweet !). This recipe came from Emeals, and it was surprisingly delicious. As you all know, I like fast and easy prep for meals and side dishes. Drizzle the squash with olive oil. Add salt, pepper, and garlic powder to taste. Sprinkle 1 Tbsp. of Parmesan cheese on each piece. Bake at 350 F for about 20-30 minutes. Test with fork to determine done-ness. I burnt mine a little, but it STILL tasted GREAT.